Naturally, you'll be growing crops on your farm. In Light of Hope, you can grow crops in other areas outside of your farm too! Crops can be grown all year long, and the same crop seeds can be planted in every season: Spring, Summer, Fall, and Winter. The crops will grow better in specific seasons, but they can be grown in any season. 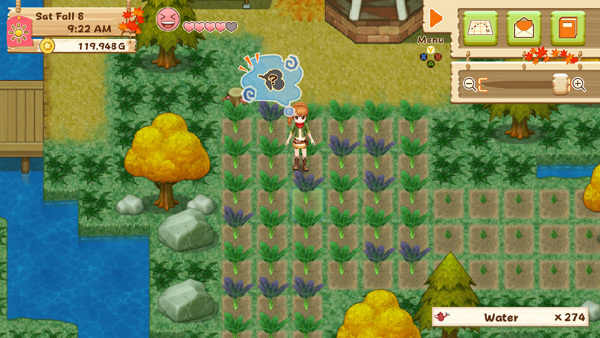 Jeanne will give you a watering can, hoe, and cabbage seeds when you first start on your farm. She'll also show you how to till the soil on your farm, plant seeds, and then water the seeds to make the seeds sprout and grow into crops you can harvest. You don't have to water your seeds on rainy or snowy days. 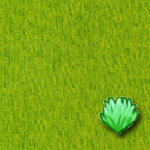 New seeds will be for sale as you proceed through the game. Sam sells crop seeds and Carol sells flower seeds. Sam's shop is open Monday through Saturday from 6:00 AM to 8:00 PM. Sam's location will change depending on the day of the week, so check your in-game map to see if he's either in Beacon Town, on your farm, or in the Mountain area. Carol's shop is also open Monday through Saturday, but she stays in Beacon Town and doesn't move around like Sam does. Her hours are from 10:00 AM to 8:00 PM. The basic level of seeds unlock naturally as you restore the lighthouse, while the hybrid seeds unlock as you sell a certain number of harvests (10, 20, or 30). Selling crops to unlock their seeds can be done either by shipping the crops in your shipping bin or selling them directly to Sam (crops) or Carol (flowers). 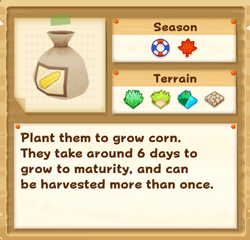 When going to buy seeds from Sam or Carol, the seed review screen will tell you the preferred season the crop grows in, the type of terrain it likes, how many days it will take for the crop to mature, and if the crop can be harvested more than once. A bag of seeds will plant one crop in your tilled soil. If you want to plant 9 crops, you've to buy 9 bags of seeds. 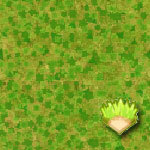 There are four types of terrain you can plant crops in. Different terrain are in different areas of Beacon Island. A terrain will not change from one type to another. Grassy: This soil can be found everywhere on your farm on both sides of the bridges. Mixed: A combination of dry and grassy soil found in the mountain area just north of your farm. It is also on the cliff area above Sofia's Livestock shop. Dry: At the top of the mountain above the Goddess' Spring, by Edmond's house. Swamp: Found in the southwest corner of the island. You'll need to repair some bridges after you complete the main storyline to reach these areas. Picking the terrain to grow your crops in won't affect growth rate, but it can affect the chance of triggering a crop mutation. These new types of crops grow from basic seeds and can be used for cooking recipes, making fertilizer, completing villager requests, or selling for more profit (though in general, mining is more profitable than farming). Terrain will not change from one type to another based on environmental factors; rainy days will not turn grassy terrain into swampy terrain. To plant a seed, simply use your hoe on the terrain of choice, then press the action button to till the terrain. If you have upgraded your hoe at Gus' blacksmith shop, hold down the action button to power up and extend the range of terrain you're impacting. Then simply move your cursor over to the freshly-tilled area and press the action button again to select the seed you want to plant. Again, you can hold down the action button to spread the seeds in a 3x3 range. The higher the crop's health, the better the chance of it surviving bad weather storms and possibly mutating into a new type of crop if grown on the right terrain and in the right season. Poor health crops have a greater chance of wilting the next morning. If your crop's health is poor, you can spruce it up by applying fertilizer. You can add fertilizer once per day after you water the plants. Fertilizer can be purchased from Carol's flower shop or manufactured at the Fertilizer Bin on your farm. There are two other Fertilizer Bins on the island, which are both connected to the main one on your farm for storage purposes. Plants that are healthy can also live through the season change. When the right conditions are met, crops can transform into new crops when they're ready to be picked. 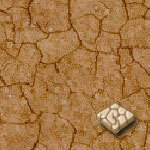 The plant's chances of mutating depends on the crop's health, the season, and the terrain. 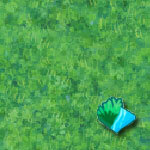 Crops that regrow (corn, green peppers, etc.) that do mutate will continue to produce the mutated crop, while one-time harvested crops (tomato, celery, etc.) will have to be planted after harvest for the mutation to possibly trigger again. When a mutation triggers, the crop or flower will visibly be different than the crops around it. The farming friend thought bubble will display a "?" crop icon if you've never harvested that particular crop mutation before. The parent crop that triggers the mutation might need to be planted in a season it doesn't like. For example, growing Strawberry during Winter can result in the crop changing into White Berry, but Strawberry is very unhappy when forced to grow during the harsh snowy weather. This is why daily use of Fertilizer is very important in this instance, so the Strawberry will survive long enough for harvest and possibly mutate into White Berry. After you sell a specific number of mutations to the shipping bin, Sam (for crops), or Carol (for flowers), the seed vendors will being to sell the seeds for that mutation. Many of the second-generation crops can mutate into third-generation mutations. Mutating a mutated crop typically require more stringent criteria to trigger the mutation such as high crop health and specialty fertilizer.